Let's Boogie! 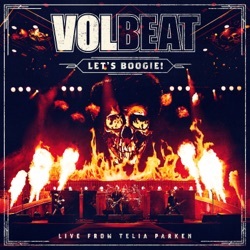 Live From Telia Parken is a live album by Volbeat, released by Universal Music on December 14, 2018. Here you go from beginning to end in one direction only: forward. LET'S BOOGIE is a powerful live document. Let’s Boogie: Live From Telia Parken show them Danish rockers at their best and live in their home country of Denmark. Well produced, great sounding and a neat vision of the band at their best. For over 2 hours, the band create a show that makes you envious of not being apart of. There are good live albums and there are great ones. This falls very comfortably into the latter. It’s not just a cracking “best of” selection, it does a fantastic job of capturing a very special night indeed for Volbeat and 50,000 of their fans. Basically this two and a half hours is a bit like when a football team wins the league and has an open top bus top ride around the city as well-wishers cheer them on. GREAT band live ...!! Volbeat could play Hank Williams Sr. and make it sound awesome ...... oh wait.... they’ve already done that....!! Great musicians playing great music. I’m stoked to see they are touring again shortly. In the meantime, I’m digging the first two songs on this live album. Not a Big VB Fan But......... I think I will be after this comes out! Hate to blog, but.... why no ‘Ring of Fire’ before SMT?? Love the live versions of that. Survey says: BUY IT! Ramadi obviously needs occupation Volbeat is consistently fantastic! I have seen them live and I was converted. If stuck on a desert island with only one band, it would have to be Volbeat! Please no Why wont this band go away?